I'm having to dig up my account I haven't used in ages, but I'm going to compete! Why are all the scores posted with (current?) backgrounds? Is that a rule? 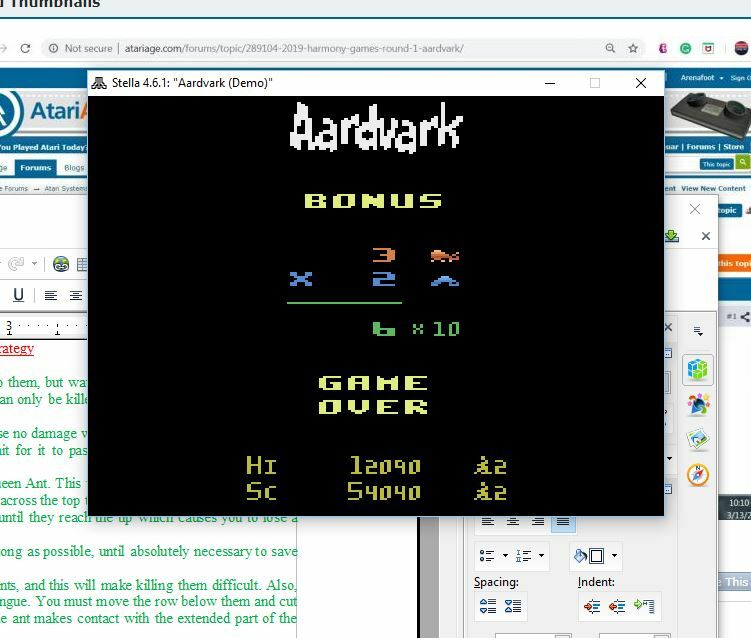 its not a rule thats how they do it when the play using emulator they prob forget to minimize the other windows. 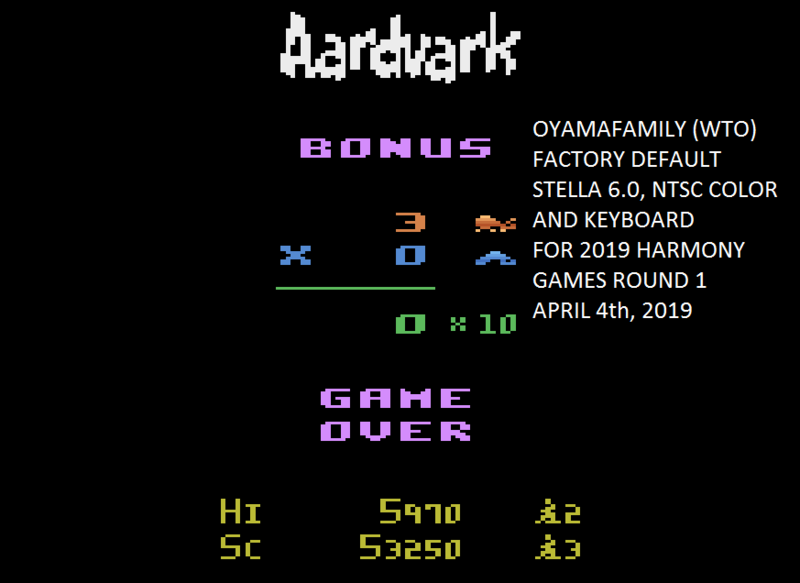 It's done that way to prove that the score was achieved since the contest started (March 11th) and not a previously achieved score. 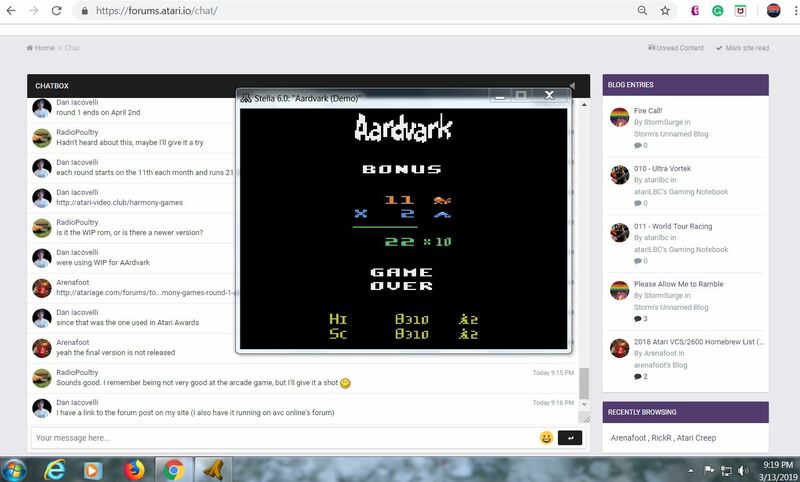 Since Dan is running this contest and he mentioned it in the chat during Wednesday Night's Atari chat, I used the chatroom as the background on the first go. 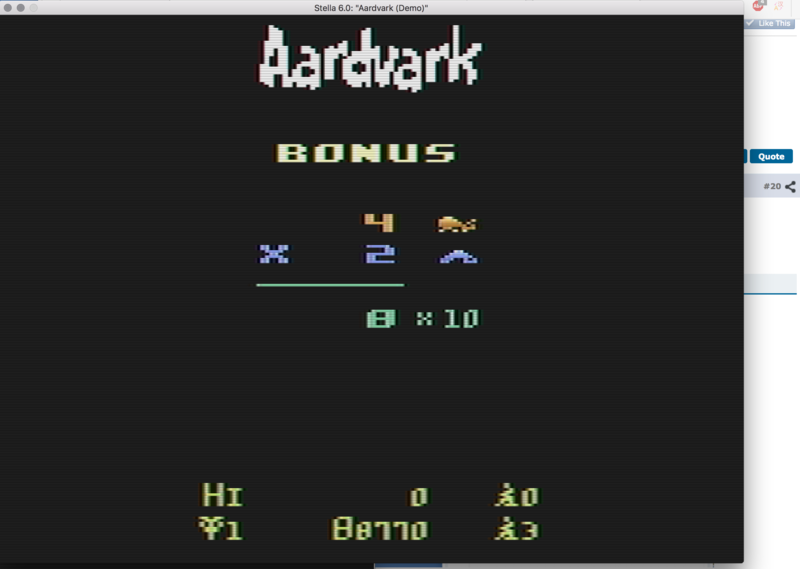 Second attempt, I used the post here at AtariAge. 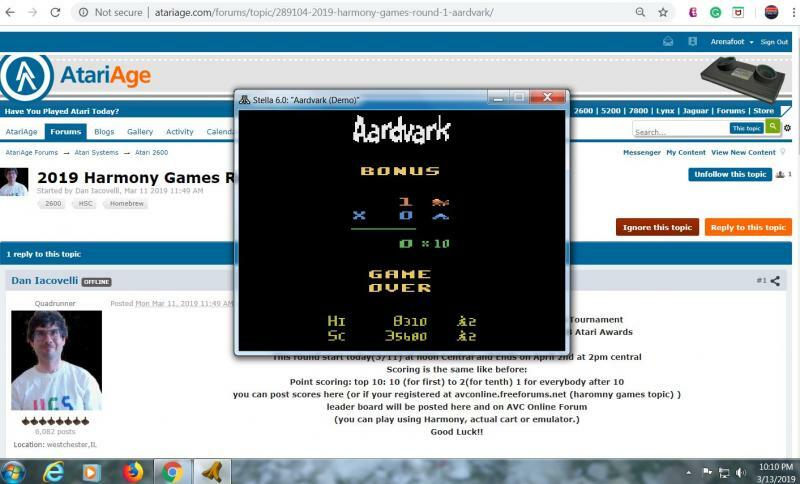 Highscore.com requires something similar for their verification of scores (must show gamers tag within the photo). well I did not know that just figured that they forget to minimize the windows behind. 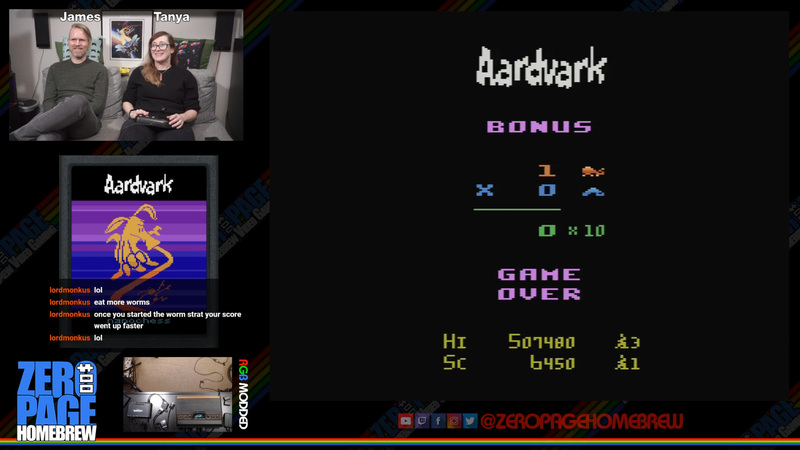 Just finished an impromptu ZeroPage stream playing Aardvark with Tanya! I had to stop after a while because my wrist was sore so I made it a goal to make it to 500k (I had 7 lives at that point). I'll update my post with the link to the YouTube archive tomorrow. :-) You can check it out on Twitch in the mean time if you like. 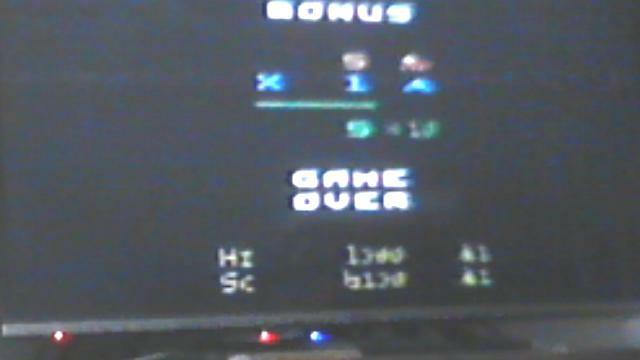 Looks like you would have rolled the 5 level demo version. That definitely won't happen with the final release. But your hefty training with the demo should help. Many many many times! :-) I commented that my training will definitely help in the final release, I honed my pattern and strategy down perfectly. Also I found a very odd bug during my extensive play session last night but I'll post it in Aardvark thread. Edited by mika, Tue Apr 2, 2019 5:55 AM. Edited by Dan Iacovelli, Tue Apr 2, 2019 2:03 PM.